PHOENIX — In a waiting game full of anxiety and uncertainty, thousands of DACA recipients in Arizona are waiting to see if the Trump administration will rescind the program that has allowed them to stay legally in the country they call home. DACA, or Deferred Action for Childhood Arrivals, was enacted by President Barack Obama in 2012 through executive order and there are no protections surrounding it to keep it from being eliminated. It would only take a signature from President Donald Trump to radically change the lives of nearly 28,000 DACA status holders in Arizona. 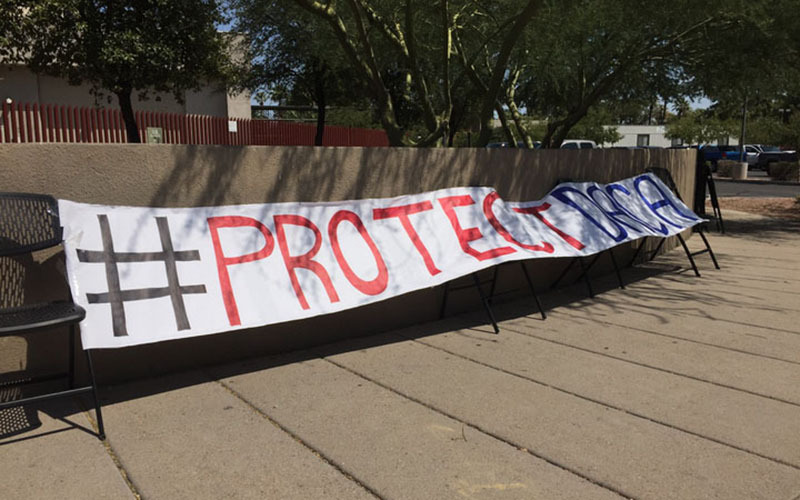 Earlier this year, an appeals court overturned in-state tuition for DACA students in Arizona. In addition, DAPA, or Deferred Action for Parents of Americans and Lawful Permanent Residents was terminated. In order to qualify for DACA status, one must be an undocumented immigrant who entered the country before the age of 16 – but couldn’t have been older than 30 when the program was implemented – must pass a background check and must have no criminal record. One must also either be in school currently, a high school graduate or G.E.D. equivalent or an honorably discharged military veteran. The government has also required a renewal process every two years, with a $500 accompanying fee. All hopefuls must complete an application on the U.S. Citizenship and Immigration Services’ website, but applicants say it is not an easy process to navigate. 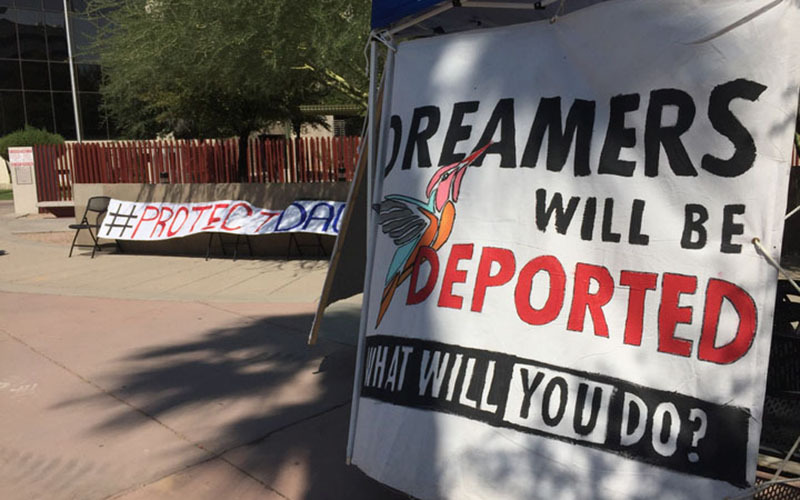 Oscar Hernandez, a student at Arizona State University and a member of Undocumented Students for Educational Equity, said the process of applying for DACA status can be challenging because of the documentation and time requirements. “A lot of the time these people couldn’t collect all of these documents and some of them were like ‘I don’t have it, I never thought about saving all these documents from years ago’,” Hernandez said. DACA students are also not eligible for Federal Student Aid, or FAFSA, so their tuition must be paid on their own or through private scholarships. Hernandez said that because of this, practically all the recipients can do is work. Hernandez said DACA students can feel out of place and vulnerable, especially with the imminent threat of everything being taken away. The future is uncertain, but Lisa Magaña, associate professor of transborder studies at Arizona State University, said she thinks many of these recipients will continue to live in the United States even if the program ends. She added that ending DACA would send a terrible message — but one that it is consistent with the campaign promises Trump said he intended to keep. “He’s made it much easier to remove unauthorized immigrants, when in the past there was a priority to remove criminals or really bad people,” she said. The law protects DACA recipients by giving them a temporary work permit and assures them, for those two years, that they will not be removed from the country. If DACA is terminated, those under it will have little options left, Magaña said. Ken Paxton, the Texas Attorney General who is leading a 10-state coalition to end the program, has suggested it be phased out, meaning no new DACA permits would get issued and the current ones would not get renewed. Michelle Mittelstadt, the Director of Communications and Public Affairs at the Migration Policy Institute, said that once a DACA recipient loses their status, they can be legally removed from the country. In a phone interview with Cronkite News, Mittelstadt also said that in the past, Customs and Immigration Services has had a policy of not sharing DACA records with Immigration and Customs Enforcement, or ICE, but she’s not sure if that will remain the same under the Trump administration, adding to the uncertainty. What is sure is the ultimatum that Paxton and others have given Trump — to make a decision by Sept. 5.